Currently Windows Phone 7 Marketplace is not available in Malaysia, and the only way for Malaysia Windows Phone developers to submit our applications is through third party companies like Yalla App or App Exchange (they just rename their website to App Gateway recently, check the update in the end of this post). I personally experience the service offer by this 2 companies and App Exchange had pissed me off. If compare both Yalla App and App Exchange, App Exchange is just super duper terrible, horrible and vegetable! I think the “great service” offer by App Exchange deserve a blog post from me. I mean very expansive, a lot expansive. Compare Yalla App and App Exchange this two companies, Yalla App charge 1.00 USD for each app submission while App Exchange charge 39.99 USD (previously 19.99 USD) for each app submission. It is 40 times much more expansive to submit your app through App Exchange than Yalla App. It is just 99 USD to open an account in marketplace and yet App Exchange charge developer 39.99 USD for each app submission. Imagine how much they can earn when you submit your app through App Exchange. 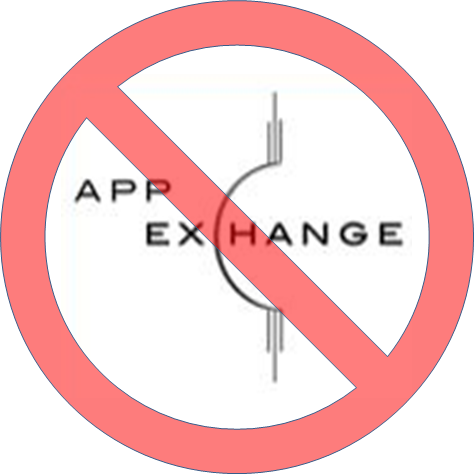 Even App Exchange charge high amount of fee on developer for each app submission, only free app is allowed currently. Yes, you wouldn’t earn a single sen through app download but only through advertisement put on your app only (if you got put advertisement in your app at the first place). If you have a question about their service, don’t even think they will reply you in e-mail. Seriously, they never reply e-mail. Previously, I submitted an app and they mess up my application description which they ignore all the formating I made, I complain this through e-mail, and they never reply my e-mail until today. While the other time I complain my app submission problem to them through e-mail, they also never reply my e-mail, completely! Customer service zero! Once you open App Exchange website, you will find out. I guess any experience web designer or web programmer can create a better website than App Exchange website. Basically you can’t found any information on the website other than how you pay them! Unlike Yalla App, if you mistakenly submit a wrong size of icon image, Yalla App will stop you from completing the app submission, but App Exchange will let you submit and then reject your app later on (Yes, that cost you one time of app submission money). You may receive some very funny random submission failure reason from App Exchange which is not from Windows Phone marketplace but App Exchange instead. 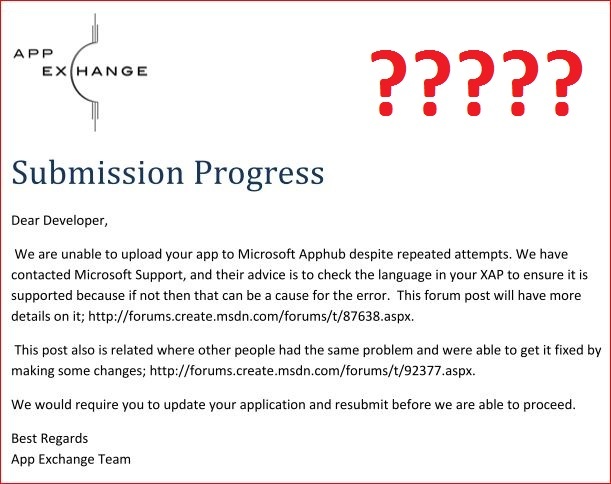 I had submitted an app with the content in English language but App Exchange reject my app and said language used in my app was not supported so they fail to submit my app (Note: the report was generated by App Exchange not Windows Phone marketplace). Can’t they understand what is English? Never mind, I submit another app but also got rejected with the reason they can’t open my xap file! OK, why App Exchange need to open my XAP file? Aren’t Windows Phone marketplace is the one who will validate my app? By the way, this 2 case also cost one app submission fee even the app never went though any verification. Don’t trust all the e-mail send by App Exchange. One of my friend who submitted an app through App Exchange and the app get published successfully on marketplace, but App Exchange e-mail my friend saying the app fail to go through verification process and attached a report from Windows Phone marketplace. The app had been published and App Exchange still want to earn more money by telling my friend to re-submit the app again? Without any reason, I receive lot of e-mail from App Exchange today telling me all the apps that already published on marketplace is published! Man, those apps was published long time ago, and you had notified me before this, why send the same thing to me again and again? Now, you may wonder even with the terrible service of App Exchange and still I submitted multiple app through App Exchange. This is because I was pointed to submit my app through App Exchange and someone is paying the bill instead. I wound not pay a single sen for their terrible service. If you want to submit your Windows Phone application and Windows Phone marketplace is not available in your country yet, go ahead with other company like Yalla App and forget about App Exchange. Don’t ruin your app and your mood by going through all the terrible service. Update #1: App Exchange had just renamed their service to App Gateway instead with the following reason. Salesforce want to claim the URL? Really? That sound more like they just screw thing up and want to change to a new domain name and a new website name to brush away what they did before. Bad, very bad!